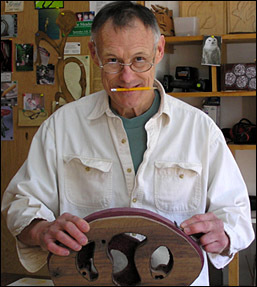 Howard A. Schroeder has sculpted since 1972. Except for a session at Penland School of Crafts in western North Carolina, he is self-taught. He is originally from Delaware, where his father, Howard S. Schroeder (http://howardschroederart.com), was a prominent painter. Howard currently lives in Northfield, Minnesota, with his wife, Jane. He maintains a studio and gallery at his home. Flowing, unending lines, often associated with the beauty of athletes and animals in motion, frequently dominate his work. When he talks about his goals for his work, he uses words like graceful, elegant, and strong. This makes sense when one realizes that he's been a tennis professional for many years. Inspiration for this work comes from sources as varied as tree branches, flowing cloud formations, dreams, visualizations, and, often, just doodling. He makes hundreds of sketches. Once a form develops on paper that finally excites him, sculpting begins. "Creating something unique is important to me. My attempt is to not copy but to initiate. The beauty of wood -- its various shades, grain patterns, branch formations, and flexibility in use -- promotes this creativity. Starting from a vague sketch and evolving into a finished sculpture is highly motivating. The joy I receive is not only in the process but seeing/feeling/caressing the completed sculpture." These wood sculptures are generally made from kiln-dried hardwoods, then finished with many coats of tung oil or a similar finish. They are intended for indoor display and will be best preserved in a controlled climate, away from direct sunlight. All sculptures on this web site are hand-created by the artist, and most are available for purchase or reproduction. A few of the works here are one of a kind and not available for reproduction. Sculptures originally created with one type of wood may be requested in a different type of wood, depending on availability and structural integrity of the wood. Phone and e-mail are below.